A Byzantine Liturgy is held every year at the Basilica of St. Ann in Scranton, Pennsylvania. This has been a long-standing tradition to provide an opportunity for all Catholics to participate in a Divine Liturgy of the Eastern Rite. 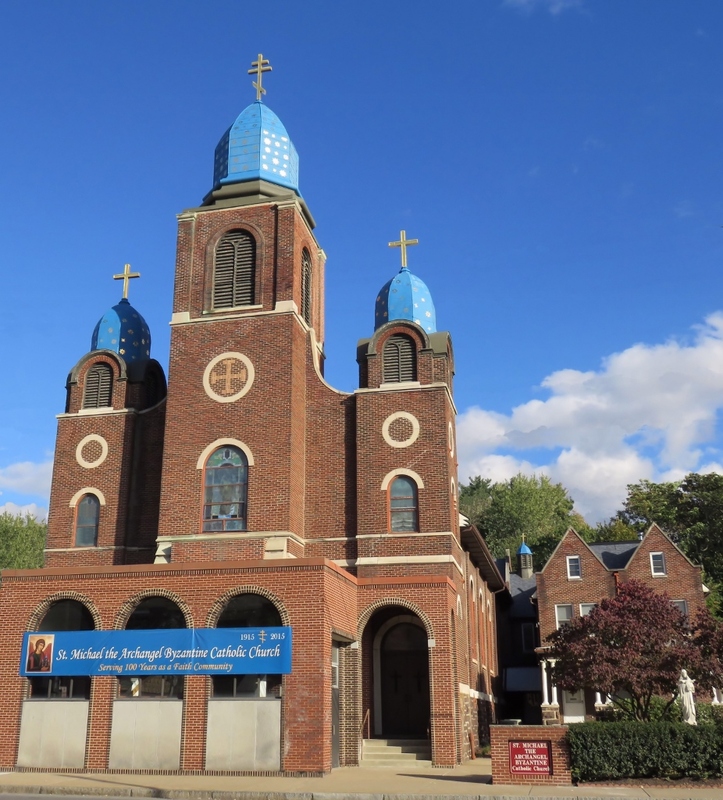 It is most gracious for the Passionist Community of Scranton to host the Byzantine clergy in recognition of the unity of all Catholics in devotion to St. Ann at this historic site and shrine. The (2017) Liturgy will be held in the upper main church. Right Reverend Archpriest James G. Hayer, Protosyncellus of the Byzantine Ruthenian Eparchy of Passaic, New Jersey, will be the main celebrant. The Liturgy will be concelebrated with other Byzantine area clergy, deacons, and altar servers. The traditional blessing with the relic of St. Ann will follow. Icon of St. Anne and the Holy Theotokos (in the lower church). The icon was donated by the Byzantine Eparchy of Passaic, NJ to the Basilica, Scranton, Pa. The Basilica of St. Ann is best known for St. Ann’s Novena held July 17 to July 26 each year that draws thousands of Catholics from near and far to the Shrine and peaceful site. The monastery was dedicated to St. Ann in the early 1900’s by the Passionist priests and is their home community. St. Ann is the patron saint of miners, appropriate to the history of coal mining in the area. Mine subsidence has a history in the region due to the way anthracite coal was mined underground. A miracle occurred at the monastery and church property in the early 1900s. There were two major mine subsidences on the grounds of the monastery and the church itself was threatened as a result. Miraculously, just 2 days after the July Novena in 1913, a subterranean slide of boulders occurred and this unusual event reinforced the foundation of earth under the church in a manner that permanently ended the danger to the church. Many prayers have been answered since the inception of the public devotion to St. Ann, and faithful in the area and beyond, return unceasingly to St. Ann’s for the Novena. For many familiar with the novena, this special week in July has become a family tradition that continues to be passed along through generations. Saint Pope John Paul II declared St. Ann’s National Shrine to be a Minor Basilica on October 27, 1997. The preachers for the 2017 novena are Father Melvin Shorter, C.P., and Father Paul Ruttle, C.P. Confession is available before and after each Mass and Novena Service. A food stand and dining tent is located on the lower section on the shrine grounds during the annual novena. By ByzantineCatholic in Byzantine Catholic on July 16, 2017 .